It’s not clear when this was recorded, though it was on a New Year’s Day. Given that it was released in September(!) 2011, it’s safe to say this was recorded starting at midnight on January 1, 2011 in San Francisco’s Great American Music Hall. I have some difficult history with Fantômas live. On New Year’s Eve 1999 I disappointedly showed up at their show just at the end of their set (they were second in a lineup of five). And on something like September 14th or 15th 2001 I had tickets to their show in Minneapolis, but because some assholes flew planes into the World Trade Center a few days prior, I couldn’t get out of Portland in order to see it. And then I feel like I did see them on the Suspended Animation tour in Boston with The Locust opening, but I don’t see a review of that show. So, anyway, it’s weird that the band would perform the entirety of this album ten years after its release and six years after they’d released anything at all, but I was happy to get it even then since it really is an amazing album. They do the entire thing live, but in a different order, and they pull it off, too, which is impressive since there are an awful lot of studio tricks and the virtuosity required is nothing to sneeze at either. But more than the excellent source material, the exquisite performances, and the fantastic sound, this DVD is special because of the visual production. The first few tracks start off pretty standard, and then over the next 40 minutes or so things start getting trippier and trippier. It starts with some intentionally grainy footage and a few different screens, and moves onto ghost images, a rotating stage, and special effects that include distorting the band’s faces into demons from a terrible acid trip. It’s appropriate for a soundtrack consisting of horror movie themes. The encore has them doing a fart-heavy (no, really) version of Al Green’s “Simply Beautiful” over visuals of bears and gorillas taking shits (no, really) and closing with “Chariot Choogle,” a T-Rex cover and probably my favorite song of theirs. I might have been tempted to give this five clowns had they stopped there, but for some reason they end with some weird guy who seems like he might be homeless and has recently been discharged from the hospital viewing the footage in a trailer and making “commentary” on it. It’s very difficult to watch. Fortunately, there is a more real commentary on the concert done by comedian Neil Hamburger. This won’t be for everybody, but fans of alternative comedy and Fantômas should enjoy it. It’s a single, still camera recording Hamburger watch the DVD on his bed in the Destiny Inn in Commerce, California, which he tells us is directly between a freeway (that we can see out his window) and train tracks. He proceeds at a very deliberate pace to describe his terrible stand-up show that night in Industry, instruct us on how to check for bedbugs (he finds none this night), complain about the band’s sloppy dress, and hide a room key from a prior hotel so that whoever finds it can win an Ipecac Recordings “prize pack,” among other things. There’s very little describing the actual concert, but it doesn’t matter since it’s hilarious. Coming into this I thought this would just be a standard concert DVD, and based on the history of the band, it felt like it had a real chance to just be a money grab. But I was very pleasantly surprised and thoroughly enjoyed watching it this week. Here’s a tip, though: This performance has such giant dynamic range that you don’t want to listen to it in the evenings on your TV while you want your kids to be sleeping and not overhearing a rock band singing horror songs and cussing. It’s better to pop this into a PC with an optical drive and put on some awesome headphones. Let yourself fall into the mesmerizing sounds and visuals Fantômas has for you. Filed Between: I haven’t unpacked my DVDs yet, either, but based on my review of The Fantômas Melvins Big Band DVD, it’s probably between that and High Fidelity. 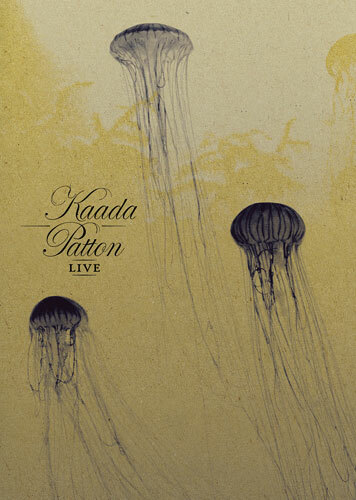 Kaada/Patton got four [clowns] for their Romances album when I reviewed that back in the day. Now that I’ve seen this DVD of them playing the album live at Roskilde in 2007, though, I feel I didn’t lavish enough praise on that disc. I’ve taken the chance to revisit it while working through this concert and have come to appreciate it more fully. I hadn’t previously conceptualized the work as a single suite, thinking of it instead as an album of songs. Seeing it performed start to finish in front of an audience, however, I don’t think it can be taken as anything but a single, epic work weaving modern pop, electronic, and avant-garde art music together. So you end up appreciating this on two levels, kind of. First, there’s the beautiful, lush, layered synths of pieces “Pitié Pour Mes Larmes” (featuring slide guitar here, which is an interesting translation of a particular studio sound), “L’Absent,” and “Seule.” And then there’s the more cognitive workout of the blips and bleeps of pieces like “Crépuscule.” Finally, there’s actually a third level where it all comes together and you integrate the other two levels, appreciating the 52 minutes as a magnificent work of instrumentation, composition, and performance. It’s really an amazing work and I’m so, so happy I got to spend more time with it. Maybe if “L’absent” didn’t drag quite as much or “Nuit Silencieuse” translated to a live setting better, this could be five clowns. I’m at least going to right the wrong of several years ago, though, and give this four-and-a-half clowns, which is a half-[clown] more than I gave the CD and at least what it deserved. Roskilde is, of course, now synonymous with the Pearl Jam tragedy. It looks like they’re in a club during the day, though. There’s a low ceiling and you can see outside. This is in black and white. That guitarist, who’s totally awesome, looks so scary. John Kaada and the five other non-Patton band members are all Norwegian. So why are the song titles in French? Names to consider naming Next: Geir, Erland, Hallvard, Børge. Joakim, Rasmus, Jan, Mads, Rikke, Svein, Siv, Reidar, Ove, Rai, Pål. I think the sound, which isn’t bad, but isn’t as lush as the studio, might hurt things here. That middle stuff is hard in the studio, too, but here even the great parts don’t sound as great. Later: I’ve come to reconcile this as the price you pay for having this performed in a live context. See the review for my evolution on that. Intro – band walking in and all that. Invocation – Here the album starts. Pitié Pour Mes Larmes – “One is for the money, ….” The guit is doing a slide thing here that I don’t remember from the album. Gives it a country feel. Aubade – This is probably the hardest point of the show, especially for an audience member who didn’t have the scaffolding of knowing the album available. When it looks like Mike’s singing he’s just making noises with his mouth, and you can barely hear that. The sound is working here, there’s just very little to hear. When they do come back big, it is nice. I don’t know if the length and depth of the quiet stretch is justified, though. There’s also a fake fade out ending followed by yet another big comeback. L’Absent – Sounds like a recorded backup choir, which I don’t remember from the cd. The sparse quiet part in here, which is basically just the guitarist playing chords slowly for several bars, is too long and just doesn’t hold together live. This is a great DVD, but these sparse parts don’t work in this setting…it’s too hard to stay focused. That’s its biggest liability. Later: Again, I largely reconciled this after re-acquainting myself with the CD. Viens, Les Gazons Sont Verts – This is the comeback song where they start to make it all work again for the new listener. The Cloroform Theme – The other track that’s not on the album. This one’s pretty cool. Credits here, too. Cloroform is Kaada’s band. Rehearsal Film – This is 16:32 long. The sad music (“Seule,” I think) at the end is kind of funny but it also kind of works. Shows them loading into a tent at the end. Photo Gallery – Unnecessary. In fact I think these are stills from the show now that I’ve seen both at least a couple of times. 58 pics.